A team of researchers, led by chemist Paul Cherukuri from Rice University, have stumbled upon a Tesla coil’s robust force field, which causes the self-assembly of carbon nanotubes into long wires. This unique phenomenon has been dubbed as “Teslaphoresis.” The research findings have been reported by in the ACS Nano journal. Cherukuri suggests that this research would be the foundation toward scalable assembly of nanotubes from scratch. Teslaphoresis works by oscillating positive and negative charges remotely in each nanotube, which would cause the nanotubes to link together forming long wires. The Tesla coil was specially designed by Cherukuri and could produce a tractor beam-like effect when nanotube wires were pulled toward the coil across great distances. Cherukuri said that this sort of force-field effect on matter has never been witnessed at such a large scale before. This phenomenon was not known to Nikola Tesla, the inventor of the Tesla coil in 1891. The coil was initially meant for supplying wireless electrical energy. The team also discovered that this phenomenon was able to assemble and power circuits that gather energy from the field. In one of the experiments by Cherukuri’s team, nanotubes were able to assemble themselves into wires, form a circuit by linking two LEDs, and finally absorb the energy from the force field of the Tesla coil in order to light them. Cherukuri then recognized that by redesigning the Tesla coil, a far greater force field could be produced at distances much greater than ever before. His team noticed the nanotubes’ movement and alignment several feet away from the coil. 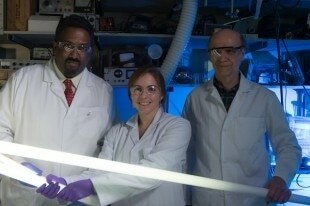 Rice researchers were keen to use nanotubes for the experiment, due to its legacy at the university. However they believe that several other nanomaterials can also be assembled in similar manners. The study paper’s lead author Lindsey Bornhoeft is a biomedical engineering graduate student at Texas A&M University. She stated that the bench-top Tesla coil’s directed force field is restricted to exactly a few feet. To be able to test the impact on matter at greater distances would require larger systems to be built. This is currently underway. Cherukuri suggested the idea of using patterned surfaces and a number of Tesla coils to produce highly complex self-assembling circuits using nanoparticles. Cherukuri and his wife, Tonya, co-author of the paper and a Rice alumni, explained that their son Adam was able to make some interesting observations while viewing the videos relating to the experiment. I was surprised that he noticed patterns in nanotube movements that I didn’t see. I couldn’t make him an author on the paper, but both he and his little brother John are acknowledged for helpful discussions. Cherukuri is a firm believer in the observational value of a youthful mind and its imagination as he himself began designing Tesla coils as a teenager. I would have never thought, as a 14-year-old kid building coils, that it was going to be useful someday. The research work was self-funded by Cherukuri and his team. This was one of the most exciting projects I’ve ever done, made even more so because it was an all-volunteer group of passionate scientists and students. But because Rice has this wonderful culture of unconventional wisdom, we were able to make an amazing discovery that pushes the frontiers of nanoscience. The team is excited to see what their research could unfold. “These nanotube wires grow and act like nerves, and controlled assembly of nanomaterials from the bottom up may be used as a template for applications in regenerative medicine,” Bornhoeft said. There are so many applications where one could utilize strong force fields to control the behavior of matter in both biological and artificial systems. And even more exciting is how much fundamental physics and chemistry we are discovering as we move along. This really is just the first act in an amazing story. Cherukuri and Bornhoeft began the project while both were at the University of Tennessee-Chattanooga. Co-authors are Rice senior Aida Castillo; Rice research scientists Carter Kittrell, Dustin James and Bruce Brinson; Rice Distinguished Faculty Fellow Bruce Johnson; Thomas Rybolt, UC Foundation Professor and chemistry department head at the University of Tennessee-Chattanooga; and Preston Smalley of the Second Baptist School in Houston, worked as a summer intern for the project at Rice.